WARNING!!! 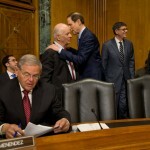 ESEA Reauthorization Passes Senate Committee! WASHINGTON — Key con­gres­sion­al lead­ers agreed on Thurs­day on leg­is­la­tion to give Pres­i­dent Oba­ma spe­cial author­i­ty to fin­ish nego­ti­at­ing one of the world’s largest trade accords, open­ing a rare bat­tle that aligns the pres­i­dent with Repub­li­cans against a broad coali­tion of Democ­rats.